Carpeting can be a major purchase for your home. You want it to have a long life, look good, and be comfortable to walk on. 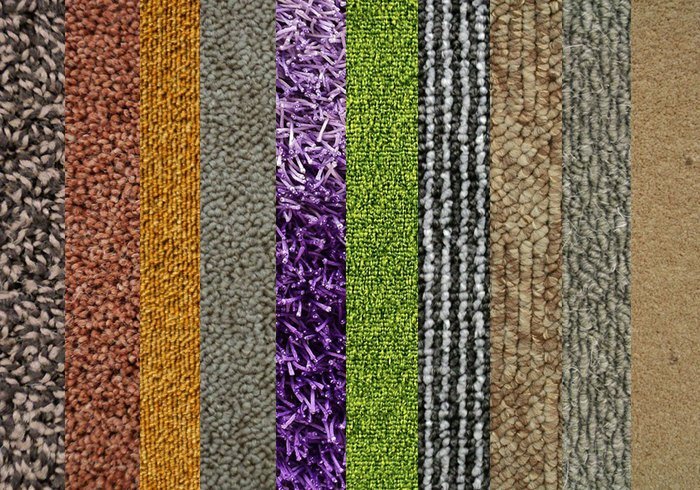 Before you choose your carpet, it is important to understand the different types of carpet piles that are available and their advantages and disadvantages. There are many styles available, offering unlimited textures and decorating possibilities, as well as different performance characteristics. Textured styles also fit well with today’s active and casual lifestyles. Textured carpet can be created through the use of several construction techniques. Many of these styles are known for their soil-hiding ability. 1. Plush – In order to manufacture a plush carpet, the fibres are twisted tightly, cut and then straightened using heat. A plush carpet consists of two or more fibres twisted together to produce a yarn. The soft texture of a plush carpet works well in both formal and informal rooms. If you do not want to see foot prints on your carpet, then do not use a plush, as it will show all foot prints and tracks from a vacuum cleaner. Plush carpets have a medium level of durability. 2. Velour – Similar to a plush but has a relatively shorter pile, which is often more dense. The tuft have a limited degree of twist incorporated during the spinning process. This allows the tuft to burst open and create the velvety appearance. 3. Saxony – The tufts on a saxony carpet will be fairly tightly twisted and heat-set to retain that configuration. The tuft length will be around 8-12mm (above the backing). The heat setting allows the tufts to remain well defined since the amount of burst will be restricted. 4. Twist – The best selling carpets are Textures. Textures work very well in family rooms, children’s bedrooms, and other informal areas within a home, primarily because of their soft feel under foot. Textures are produced with tightly twisted fibres and are set with heat creating a medium durability carpet. Texture carpets have a multi-colour appearance that hides any footprints and other tracks. 5. Frieze – For high traffic areas, a Frieze carpet is recommended. Perfect for informal areas the fibres are made of a highly twisted cut pile carpet. Frieze carpets have short fibres that curl in all directions at the surface, which has the effect of hiding all footprints and vacuum cleaner tracks. Both cut and looped fibres are combined in order to produce a Cut and Loop pile carpet. With a medium density, it provides a vast array of textures and/or sculptured effects available in solid and coloured patterns. One of the advantages of the cut and loop carpet is that because of the different levels of yarn the carpet hides dirt, stains and footprints exceptionally well. The carpet is used in both formal and informal areas in the home. For the best carpet in durability, ideal for high traffic areas and resistance to marks you should choose a carpet made with Level Loop pile techniques. These types of carpets are made by weaving even loops of yarn through both ends of the carpet’s backing. By using higher loops the carpet has a much more luxurious appearance. For easy cleaning a Level Loop carpet utilising short and densely packed loops is easy to clean as they prevent dirt from filtering into carpet. The difference between Multi-Level Loop pile and Level Loop pile is that with Level Loop Pile all of the loops of yarn are at the same height and with the Multi-Level Loop the heights of the yarn varies. The Multi-Level Loop creates a random texture making it a good choice for high traffic areas. The primary negative of this type of carpet is that the small loops have a tendency to hold more dirt and dust.